Arthur G. Greene is a principal with Boyer Greene, LLC in Bedford, New Hampshire. 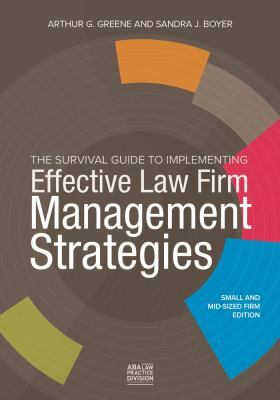 He is the author of Paralegals, Profitability, and the Future of Your Law Practice (ISBN: 978-1-59031-159-2), The Lawyer's Guide to Governing Your Firm (ISBN: 978-1-59031-780-8 ), The Lawyer's Guide to Increasing Revenue, 2nd Edition (ISBN: 978-1-61438-094-8 ), and Strengthening Your Firm: Strategies for Success (ISBN: 978-1-59031-159-2)Sandra J. Boyer is a principal and the managing shareholder of the AndersonBoyer Group. She has consulted with law firms for almost fifteen years and her practice includes general management; strategic planning; associate development; marketing; mergers and acquisitions; and personnel management, including the recruitment of the law firm administrative team. Sandra is also the executive vice president of the Network of Leading Law Firms, a non-profit organization of affiliated law firms from around the world. The network focuses on referring work between firms and preparing firms for the future of the law practice as it emerges into a new era. She previously served as the associate director of the Institute on Law Firm Management and the Administrator of the law practice management continuing education courses at the Institute of Continuing Legal Education at the University of Michigan Law School, where she developed and administered courses and seminars on law practice management. She is a member of the Law Practice Management Section of the American Bar Association and is a member of its Leadership Task Force. She is also active in the Tort Trial and Insurance Practice Section of the American Bar Association where she serves as the Chair of the Economics of Law Practice Committee and serves on the Membership Committee. In addition to being active in the American Bar Association, she is a member of the International Bar Association. Sandra authored The Administrator's Guide to Firm Dissolution and has co-authored Succession Planning: The Legal Administrator's Role in Ensuring the Future of the Firm for the 2002 Association of Legal Administrators Management Encyclopedia - Volume II. She is the co-author of Associate Retention: Keeping Our Best and Brightest (June, 2002). Her articles have been published in many law practice management newsletters, including the ABA Law Practice Management Section's Law Practice Quarterly, the International Bar Association magazine and the AndersonBoyer Group newsletter. She has lectured nationally and internationally at law practice management programs presented by the International Bar Association, the American Bar Association, the State Bar of Michigan, the Georgia State Bar, and the Association of Legal Administrators. Sandra holds a Bachelor of Arts Degree in Human Resource Administration from Concordia University.